Bats are the only mammals that have the ability of powered flight. Bats belong to the Order Chiroptera, which means "hand-wing" due to their unique flight abilities. The bones that in humans form the arms and fingers serve as structural support for the wings in bats. Bats are generally nocturnal. They sleep during the day in sheltered areas called roosts and fly at dusk to drink and forage for insects. Bats are the primary predators of flying insects, including mosquitoes! Bats can eat 50% of their body weight each evening, resulting in up to 1,500 insects a night. Bats use well-developed echolocation sonar systems to hunt. They emit high frequency sounds (too high for humans to hear) that bounce off objects in their environment. Bats use the returning echoes to determine the size, shape, texture, and movements of prey and obstacles. Bats in Alaska hibernate during winter. 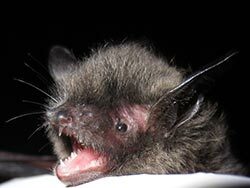 Cold temperatures mean there are no insects for bats to eat in winterTo survive without food, bats in Alaska bats hibernate. Hibernating bats lower their body temperature, metabolism, and breathing rate, dramatically reducing the amount of energy they need. Female bats usually produce one pup a year. 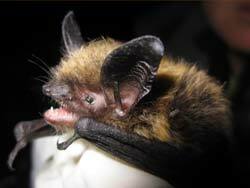 Female bats have their young during the summer months of June and July. After about 3 weeks, the juvenile bat is able to fly. Bats are long-lived animals. 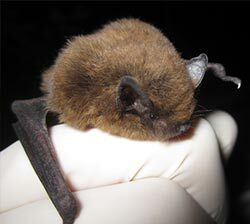 Little brown bats have been known to live as long as 30 years in the wild, with an average lifespan probably closer to 20 years. Natural predators of bats include owls when bats are flying at night and animals such as ravens if they find bats roosting.